The global industrial fall protection equipment market has been accumulating substantial gains since the last few years, due to the constantly growing employee safety concerns. The equivalent rise in safety regulations that require organizations to ensure worker safety in perilous work environments through the use of various safety equipment has also been responsible for augmenting the industry trends. According to a 2018 report by Mine Safety Appliances – a major industry player – the global safety market is estimated to be worth around $40-$45 billion. Moreover, a 2017 report by the Occupational Health & Safety magazine claims, approximately 85% of safety pros claim that human error is the biggest contributor of workplace accidents and is also responsible for a majority of trips, slips and falls that occur in a work environment. The industrial fall protection equipment market, which was valued at over $2 billion according to a 2017 estimate, would continue to gain significant traction over the forecast period as regulatory agencies such as the American National Standards Institute (ANSI) and Occupational Safety and Health Administration (OSHA) continue to impose new safety rules and regulations in an attempt to nullify the consequences of the human error factor. It is expected that the industry would be receiving growth facilitating inputs from several different industries – such as construction and mining – in developed as well as developing nations as they continue working towards improving and maintaining their respective infrastructures. The North America industrial fall protection equipment market – led predominantly by the U.S and Canada – is one of the world’s largest personal protection equipment (PPE) business spaces. The regional growth is facilitated by a work culture that gives the worker safety utmost importance. This healthy work culture coupled with strict worker safety standards that are introduced and upheld by regulatory agencies like OSHA and ANSI ensure that the North America industrial fall protection equipment market would continue to receive significant momentum. Even with several safety regulations in place, many agencies are further increasing mandates in an effort to rein in the increasing incidents of workplace trips and falls. According to a 2017 national census of Fatal Occupational Injuries, by The U.S. Bureau of Labor, work injuries from trips, slips or falls that proved to be fatal continued to rise since the general upward trend began back in 2011, increasing by around 6% to 849 fatalities in 2016 – a 25% rise since the 2011 numbers. In 2016 falls increased by more than 25% for carpenters, roofers, pruners, tree trimmers and heavy-duty vehicle drivers. 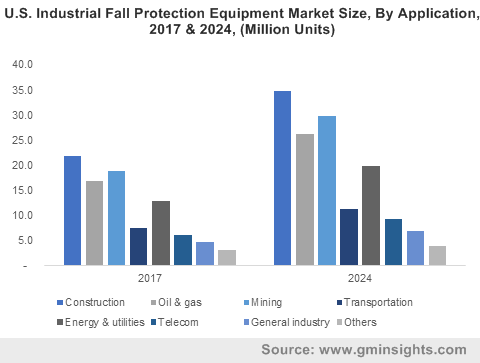 Attributing to these factors, the North America industrial fall protection equipment market is slated to register a CAGR of 6% over 2018-2024. The Europe fall protection equipment market, led by some of the continent’s biggest nations – namely UK, France, Germany and Italy – would be depicting a substantial increase in valuation in the years ahead. The major factor responsible for the same is the prevalence of work-related accidents & injuries in the region. According to a 2017 press release by the International Labor Organization and the European Agency for Safety and Health at Work (EU-OSHA), accidents and injuries that occurred in a work environment cost the European Union (EU) about €476 billion annually – which is approximately 3.3% of the region’s GDP. According to the agency, workplace injuries contributed to about 12% of the main work related illnesses and Years of life lost and lived with disability (DALY) per 100,000 workers. Driven by these trends, Europe industrial fall protection equipment market is expected to surpass USD 900 million by 2024. Attributing to the growing occurrence of workplace fall-related injuries, the industrial fall protection equipment market is expected to continue to rake in extensive revenue. With the increasing demand for PPE industry players to ensure worker safety, the global industrial fall protection equipment market is set to surpass $3.8 billion mark over the forthcoming years.